Sand used in a brick and tile manufacturing facility was being oxidised in a 'sandburner'. This consists of a four-foot diameter, twenty-four foot long rotating drum. At one end is the burner unit running on butane gas which generated a flame down the centre of the drum. 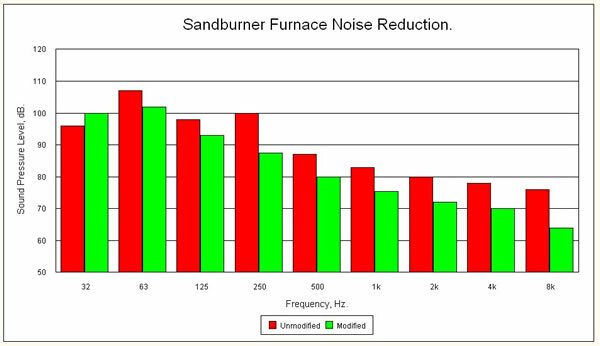 Noise levels were up to 95dB throughout most of the sandburner building. The area was very hot and dusty. The combustion process was confirmed as the dominant noise source, but no detailed diagnostic measurements could be made due to the high temperature (900°C). 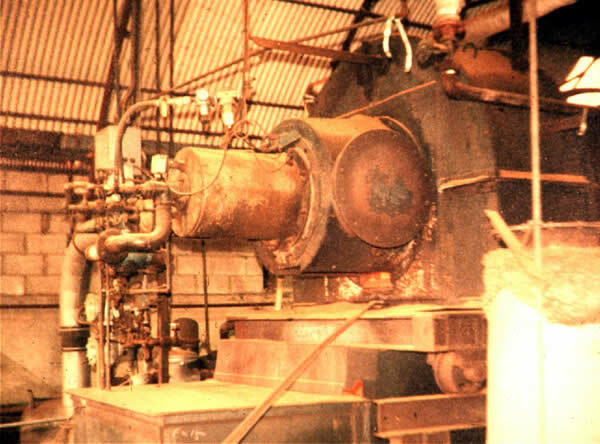 However, inspection of the design drawings of the burner led to the conclusion that it was badly designed and would result in unsteady air/gas mixing, causing fluctuations in the combustion process. These fluctuations would cause high levels of noise to be generated at the flame front. The ideal approach (which should have been done at the design stage) would have been to move the primary air control valve and re-design the mixing chamber to provide stable conditions. However, the simpler and cheaper option of inserting a carefully designed sleeve into the mixing chamber was adopted. This sleeve was designed to smooth the primary air flow and provide stable mixing conditions. Combustion noise in furnaces and burners is sensitive to fluctuations in the flow and mixing of air and fuel. A variety of techniques are available to control flame-front turbulence and hence the noise that is generated. This can be particularly valuable where low frequency noise dominates making conventional solutions very costly. The noise in the typical operator work area was reduced by 9dB. The octave band spectrum before and after modification is shown below (Note: Both measurements were made under similar conditions (900°C) but with a higher gas flow rate for the modified measurement (29 ft3/min compared with 23 ft3/min) which masks the noise reduction slightly). £500 (the material costs were negligible, the majority of costs were for fabrication and fitting of the flow control sleeve). Redland Roof Tiles Ltd. (now Lafarge Roofing Ltd.) & Industrial Noise and Vibration Centre Ltd.